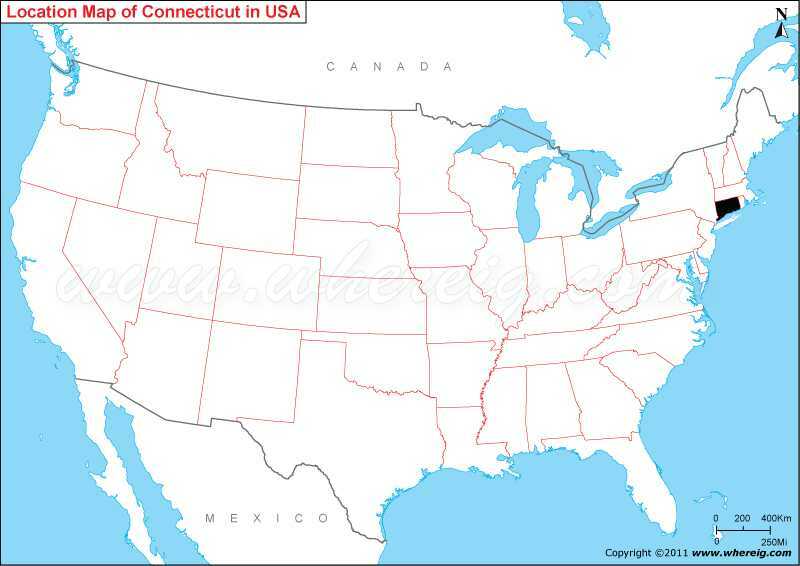 Map showing location of Connecticut on the US map. As shown in the given Connecticut location map that Connecticut is located in the north-eastern region of the country. Connecticut is the part of New England region. Connecticut map also shows that it shares its border with New York in the east, Massachusetts in the north, and Rhode Island in the east. Besides, Connecticut also shares its coastline with Atlantic Ocean. The climate type of state is temperate. The capital city of Connecticut is Hartford; however, the largest city is Bridgeport. Other important cities are New Haven, Stamford, Waterbury, and Norwalk. Important economic sectors of the state are agriculture, industries, and other financial activities. The significant agriculture produces are nursery stock, eggs, and lobster (shellfish), cattle, dairy products; and tobacco. And, the important industries are transportation equipment, particularly helicopters, aircraft parts, and nuclear submarines; military weaponry; heavy industrial machinery and electrical equipment; fabricated metal products; chemical and pharmaceutical products; and scientific instruments.